Lissa Bryan: The #ShieldGeeks Review of #VIKINGS "Death All Round"
The #ShieldGeeks Review of #VIKINGS "Death All Round"
This episode, I think was aptly named! Sandi: I do appreciate the care they take to title them. I know I have a hard time with titles. The History Channel does a great job. Even if the titles refer to some horrible and sad things. We began with wonderful scenes of the Vikings porting the boats over land, rolling the ships over lubricated logs. It gave a great sense of how much effort and labor had to go into tasks like these, the engineering and forethought. Lagertha is helping haul on the ropes to pull the ships over the log rollers. She winces and grasps her belly at one point, but goes right back to pulling. Sandi: They had a bit of a distance to go, here, but it was encouraging to show that they just did it. Marshaling local resources and getting down to business. Lagertha—yeah. The psychology of her behavior here is interesting. The Seer said she'd have no more children, yet she's pregnant. It is possible that she's decided to trust in Serendipity and do exactly as she would were she not pregnant, hoping that the chance of Fate would smile upon her. Or she's subconsciously believing the Seer and his prophecy and determines to act in such a way that will not protect her unborn child to make it come true. I don't believe she consciously is seeking to harm herself in any way. She's just going to do what she feels she must. Two locals peek through the trees. They hope the Vikings will pass them by. It's all any family could do at the time. Sandi: The average local "peasant" or "villein" had no recourse when armed men moved through their territories. They were used like canon fodder, their lands were harvested bare and ruined, and their lives were considered as nothing to noblemen waging war. Finehair and his brother Halfdan take a breakfast break to go raiding a farm. The brothers are cheerful and playful as they loot. Halfdan lobs an egg at Harald and they share a laugh as it spatters the front of his armor. The residents are obviously hiding. Halfdan lifts a pillow and finds a jewelry below. He informs his brother there are women here, and they search the barn. A hard shove on the boards of the hayloft above sends the girls crashing down. They're young - around Gyda's age. The rest of the family pleads in French and Spanish - at least I think that's what I heard. But both being Romance languages, I imagine Old French has some similarities. Sandi: It really struck me how lighthearted Harald and Halfdan are, here. Like the village was created just for their amusement and plundering. I heard Spanish, too. The lines between people were more fluid in those days and the languages were still in development. Indeed they still are. We all cringed at the thought of what was going to happen to those girls, and mercifully, the scene cut away. As they pack up to leave, we see more of that cheerful demeanor. Halfdan sings a Norse song and Harald joins in as they ride away. But we see the carnage as they're leaving. The family has been slaughtered brutally, hacked to pieces. Sandi: That's actually a poem from the Irish. The Northmen were seen as an unstoppable force to the man in the village. They came in with their axes and shields, their belief that death in battle was a good thing, their unassailable confidence that raiding was their right, to bring treasure and slaves back home, where they were needed. A run-of-the-mill farmer (or miller!) couldn't stand up to that. All they could do was pray, hope, and hide. @sandyquill @DeeDonuts @LissaBryan And suddenly I remember that no one is the good guy here. Sandi: I think Hirst has been careful to show this, in his writing of this show. People are . . . people. With strengths and failings as a community as well as in individuals. The scene cuts to little Alfred on the road approaching the city of Rome with Aethelwulf and Prudentius walking behind him. Beggars line the pilgrims' path, some more insistent than others. Athelwulf functions as the bodyguard. Alfred meets Pope Leo X. An interesting aside - Do you realize the same actor playing the pope also plays the Seer? The pope tells Alfred that he has an important destiny in defending Christendom from the pagan invaders. The pope warns him, “If Christian people do not do penance, a great and rushing disaster will swiftly come upon you.” It's a reminder the Vikings were thought of by Christians as a scourge of God, a punishment for their sins. The pope shows little Alfred a sacred relic, one of the thorns from the crown cruelly thrust on the head of Jesus when he was being crucified by the Romans. Alfred kisses it in reverence. Sandi: Alfred has been well-indoctrinated— I mean, taught!—of the tenets of the faith. At this time, that was handled by memorization, so one can imagine that the lad has a grand memory and is dedicated to learning. As indeed, King Alfred will prove in the fullness of time. I like that the show gives foreshadowing of Alfred's lifelong commitment to faith and learning even at this stage, even including the trip to Rome Alfred did indeed make the pilgrimage. The show already highlighted the early church's reverence for relics. Remember Gisla and the oriflamme? I mentioned last night that there was also a terrible market for forgeries arising at this time, and a great many people got taken in by scammers who took advantage of their faith and trust that a fellow Christian would not lie about something so sacred. Sandi: Even Chaucer had something to say about relics, having his Pardoner character in The Canterbury Tales, discuss how he (the Pardoner) cons people in the Pardoner's Prologue. Not saying that the Holy Father was using the thorn of Christ's crown of thorns as a moneymaking prop in this episode! Just a commentary that this practice did go on for centuries. There was a wonderful scene of little Alfred being crowned as a Consul of Rome while Ecbert is being crowned as the joint king of Mercia and Wessex. The bishop anoints Ecbert's head with oil and proclaims the kingdoms are forever and indissolubly joined, and Little Alfred is gifted a beautiful sword and a golden crown of laurel leaves. It would have been a moment that left a powerful impression on a young boy. Sandi: Really nice display here by the History Channel. I enjoyed how these scenes were combined with some Gregorian Chant as background music. (Not sure if it was, technically, Gregorian, but you know what I mean.) Ecbert gets to wear the Where the Wild Things Are crown so I imagine we can let the Wild Rumpus start! Judith is, of course, all smiles, but Aella is displeased by Ecbert's coronation and reminds him afterward that he and Ecbert were supposed to split Mercia equally. Ecbert betrayed him. And Aella mentions that Ecbert's new domain borders his own. Ecbert essentially tells him to learn to live with it, because that's how it is. Sandi: Yeah. ^^ That. (As an aside, @DeeDonuts always gives good GIF.) 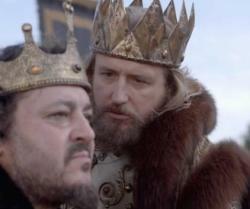 King Aelle is disgruntled and likely even angered by King Ecbert's obvious duplicity. But he is in Ecbert's court, surrounded by Ecbert's men, and can do nothing. That has to stick in his craw in a bad, bad way. We return to Paris, where Björn and his father are hastily summoned. It's Lagertha. When they arrive, they find her lying in her tent, her dress pulled up to her thighs and soaked with blood. She tells them she lost her child. She'd hoped the Seer might be wrong. She begins to sob and Ragnar pulls her into his arms to comfort her. He looks equally agonized as he holds his ex-wife and murmurs to her. But very quickly Lagretha sits up and tells him to go. “Just go away. Leave me alone.” Ragnar releases her, but he doesn't leave. He retreats just a few feet behind her and sits down, and Björn sits down on her other side. In one of those gorgeous touches of cinematography conveying emotion, their body movements are in sync as Lagertha struggles to control her grief. Sandi: That was heartbreaking for Lagertha, even though she knew it could happen. I really appreciated seeing how Ragnar supported her, and his own grief there even though the child was not his. As we said last night, these two are the great big One True Pairing for many VIKINGS fans and their chemistry is undeniable. And props to Björn, too. This is not a typical place for a son to be supportive, but he did very well. Sometimes, it's right to ignore his mother's wishes and do the right thing. Outside, Floki's eyes roll back in his head and he has a vision of Aslaug wandering around in the rain, screaming Harbard's name and falling to the earth in tears when she cannot find him. Sandi: So now we see Floki as Seer, really. He's not seeing the future, not here and not in the earlier episode when he seemed thrust into the sexual encounter between Harbard and Queen Aslaug. Instead, Floki Sees what is happening at the moment. I wonder how this will play out in the future of the show. I wonder if Kattegat's Seer really has gone on, and that's why the actor is now the pope? Simple Chuck is seated on the throne when Gisla and Rollo stride in. Since her marriage was consummated, Gisla's style has changed to sleek and simple - and frankly, rather modern-looking. Beside her, Rollo is stylin' in a shiny, shiny doublet. Simple Chuck announces Gisla's pregnancy, and then has another announcement... He's making Roland a count for his services to Frankia. Gisla doesn't look very pleased by the announcement. The king dismisses everyone but asks Roland to linger for a moment. He has an important question to ask him. After everyone is gone, Chuck lays it out in the bluntest terms possible. Chuck wants Therese as his mistress and he wants to know if Roland would be upset about it. Not at all, Roland says with aplomb. In fact, she'd be the happiest woman in Frankia, he's sure. He turns to go and Chuck tells him there's just one more thing he'd like to ask about. Sandi: I think the thing with Gisla's wardrobe is that she isn't having to prove anything any longer. Not to her father, not to the court. She's married to a man she (finally) respects (though she finds it necessary to lecture him about How to be Frankish quite often) and she no longer has to build her reputation in her wardrobe. She is who she is, and that's enough. I do concur, though, that her wardrobe does seem almost modern in its lines. (I am reminded of the wonderful series Robin Hood from the BBC, where the characters dressed in such a way as to call forth modern stylings using traditional means.) I will say though that I am getting rather tired of her pedantic manner. Still, there's a lesson to be learned here: We often tend to think our own culture is the superior one. We should guard against this when dealing with others. We cut to Rollo and Gisla's bedroom as they're retiring. Gisla undresses behind a screen as she gives Rollo a lecture/lesson on... something. Sorry, it sort of just went in one ear and out the other. I did catch, though, that she's unhappy about her father honoring "those people." She puts on a white cottony-looking nightgown, complete with little satin bows and climbs into the very 18th century-looking bed with its scalloped headboard and pulled-back curtains. Rollo is also wearing a nightgown, and it has a shiny placard breast. Sandi: Yeah. The use of nightwear was extremely rare, back then. A bridal couple on their wedding night might have something to wear, if they were noble, because there was an audience to their bedding ceremonies. But even then, it was rare to use valuable resources on a garment one wore only to sleep in. There are accounts of even kings holding court in their beds, naked under their bedding but for a cap on their heads. This was also rare, but it happened. The #BootSoleFile is swelling a bit, eh? And they were doing so well with the portage and such! Alas! In any case, Rollo starts to get frisky, and Gisla rebuffs him. She's pregnant, she reminds him. Yeah, he says, and he's real happy about that. She tells him he cannot have carnal relations with her while she's in this sacred state. I predicted this will not end well, and let me repeat that now: this will not end well. Rollo and Gisla had a good thing going here for a while, but it's probably about to be seriously challenged because Rollo is not going to take to almost a year's worth of abstinence well. How soon before his eye begins to roam? And how will Pepe le Princess take that? Considering her other views on marriage, I imagine she won't accept it with a simple, "Well, that's noblemen for you!" At dawn, Simple Chuck rolls out of bed, dressed in his own nightgown, this one of a vibrant blue. Sandi: Another note on their clothing: Blue is a notoriously difficult color to make permanent in a fabric dye. It's one reason why purple was considered a royal color. So using it for nightwear, again, is unreasonable. Sorry. I just had to get that out. He strolls to the window, leaving a sleeping partner in the bed. It's not until he glances back that we see who it is... Roland. At the Viking encampment, Torvi and Björn make love while Erlendur watches. When they've finished, Björn asks Torvi why she came with him when he asked. What does she want from this? Torvi says with a bit of amusement that it took him long enough to ask. Sandi: I don't equate Torvi with Salome, understand, it was just something I heard in my head at that point in the story. She sees Erlendur aiming a crossbow at Björn, so she climbs back atop him and slides to his side, blocking Erlendur's shot. In Kattegat, Sigurd is floating a little boat down the creek when he comes upon a body laying on the bank. It's little Siggy, and she's dead, drowned like her namesake. Sigurd goes into the house. Ivar is playing a game with his mother. She's drinking heavily. She's gone full Circe Lannister in this episode, I swear. She makes a bad move on the game board and Ivar announces it was stupid. He's won now. Aslaug retorts that he shouldn't call her stupid. After all, if it wasn't for her, he wouldn't even be alive. Sandi: SIGLET! I mourn for the poor little girl who had nobody to truly care about her. And let's take a moment to check out Ivar, shall we? He is the same boy who screamed in fear when he killed the other child with an axe. Blood all over his face, the boy was a mess until his mama told him it wasn't his fault. Everything was going to be fine. Have a biscuit. And now, he's going full-on psychopath here in this scene. Sigurd comes forward and announces he found Siggy's body. Aslaug first says "Who?" before it clicks into place. Aslaug isn't the slightest bit troubled by this news. She asks if someone was taking care of the child, and Sigurd says apparently not. Sandi: Sigurd is the only one who seems to have known the little girl existed, at this point, and even he didn't value her highly at all. One can only think that Harbard used this little girl as his sacrifice (of whatever nature) much in the way he took Siggy's life before. I will miss Siglet. Here's what throws me about this... Siggy was Ragnar's granddaughter, daughter of his eldest son. Even if Aslaug was indifferent to her, you'd think the child would have some value in the community. Everyone knows how much Ragnar adores the children in his family. Ragmar is going to be very upset when he returns and finds out his first grandchild died of what is essentially neglect. Björn, too. The girl may not have "value" to Aslaug, but she will be a princess one day and her hand has value in marriage negotiations. Ivar interjects. "Who cares?" Sigurd turns and stomps out as Aslaug gives a chilling smile. The happiest smile we've seen from her in a long while. Sandi: These two have gone from sad figures to bad guys. They were to be pitied at one point, I feel. Aslaug as a neglected wife, for all she did all that was asked of her and Ivar who was born with a deformity (in the show) and has to be tended as an invalid for a time. Now, she's caught up in her Harbard-addiction and getting drunk in the presence of her children and he's telling his mother she's stupid and he doesn't even care when a girl raised in his household is found abandoned and dead. The Vikings have reached the opposite side of the river. They all gather to cheer the sight of Paris in the distance. Sandi: You have to feel for them, here. Though they are a seafaring folk, this might have been the longest distance any of them have had to transport their ships. What if Ragnar didn't have it right? What if they climbed that last rise and found...more land? This was a vindication of sorts for Ragnar, but he doesn't seem remotely aware of it. He's in a bad, bad way, thanks to Yidu's "medicine". In his tent, Erlendur is sacrificing a rabbit, gathering its blood in a cup. Torvi crouches down beside him. She asks if she returns to him as his wife, if he will abandon his plan to kill Björn. Erlendur says he never will. He is a Viking; they don't give up on vengeance. Ragnar killed his father. He must have his revenge. Something in the sacrifice makes him say that the gods have determined it must be Torvi who slays Björn. She tries to protest, but Erlendur threatens her son again. He presses his crossbow into her hands and forces her to drink the blood from the cup. Torvi strides outside and sees Björn standing in the center of the camp. She has a dribble of blood running down the corner of her mouth. She tells him that she has to kill him to avenge Erlendur's father. Björn gives a small sigh and asks her what she's waiting for. Torvi lifts the crossbow, spins, and puts a bolt through Erlendur's chest. Way to go, Torvi! As she told Björn many episodes ago, she is a Viking, too. Björn goes over to Erlendur's gasping body and drops Erlendur's ring onto the shaft of the crossbow bolt. Sandi: I thought it interesting, here, that after all of Björn's brooding on the matter, he is not the agency by which the Erlandur matter is ended. Instead, it is Torvi who has the opportunity and strength of purpose to end it. Forever, one hopes. Ragnar is very ill and hallucinating. He thinks he's vomiting up spiders. Sandi: This is a bad, bad thing. When a king is seeing things, how reliable can he be? No one knows exactly what he's seeing, which is something, but it is worrisome. Björn goes into his father's tent and finds him smashing imaginary spiders on its floor, pausing now and then to vomit helplessly. Ragnar looks awful. Ragnar finally tells Björn the trouble: Yidu gave him something she called medicine, but now without it, Ragnar feels poisoned. It should be noted here that this is the only mention of Yidu in the episode, and Björn doesn't follow it up by asking whatever happened to that girl, anyway? Though Yidu was "just a slave," it seems odd that Björn wouldn't at least mention her absence. After all, Yidu speaks French, and could reveal their plans if she'd run off. Sandi: For all that Björn is growing into himself and learning leadership skills, he is not entirely savvy yet. It did seem strange that Yidu's absence from Ragnar's side is not more widely noted. So many did not care for her that one would think there'd be some kind of response to her absence. If only smiles and crossed glances. Björn is focused instead on his father's illness. He asks, rather naively, why Ragnar doesn't just take more of the drug if being without it makes him so ill. Ragnar says he has to save the little that's left for the fight with Rollo. Paris doesn't matter, he tells Björn. Only his fight with Rollo. Ragnar stands and starts to tug on his leather armor, but you can see it's exhausting him. With tender hands, Björn helps him dress. Sandi: This was a great moment, though not surrounded in pomp and noise. One is reminded that parents care for children and then, one day, children care for their parents. It's a bond. It's good to see Björn acting thus, here. But still, his neglected daughter is dead far in the north and he doesn't even know it. That's painful. We see the ships on the water in the last scene. They were transporting the battle platforms between the longships, something I'd never seen before, but it was ingenious. Floki's work, no doubt! Sandi: The man is a genius in such matters, for all that I'm not a fan of his character. Fully maneuverable floating platforms were used by other Vikings as well as other cultures to facilitate fighting on the water while using advantages available on land, such as room to maneuver. The battle platform was indeed ingenious. For the Vikings in particular, these platforms were of great use when fighting in fjørds and lakes and rivers. On the prow, Ragnar mutters about Rollo. "I must kill you. I have to kill you. I will kill you." Sandi: And next week, this confrontation might very well happen.